This dish paired a warm caramelized onion croquette with a puree of Spring ramp, Prime Angus tartare, sunny side-up quail egg, wild mushroom and beef consomme terrine and pea tendrils from Lucky Leaf Gardens. The croquette was prepared by making a caramelized onion risotto and then chilling it down before shaping small two ounce portions into cylinders. The chilled risotto can be piped with a pastry bag then sliced into cylinders to prepare large batches quickly. It was then double-breaded with flour, egg wash and a combination of panko breadcrumb and Wondra flour before frying and finishing with kosher salt. The steak tartare consisted of freshly ground Prime Angus tenderloin scrap, mixed with minced red onion, salad oil, chopped capers, finely minced anchovy, dijon mustard, kosher salt and toasted and ground black pepper. Legend has it that steak tartare originated with the nomadic Tatar people of Central Asia, who rode on horseback and seldom had the time to cook their beef. It is said that rather than mincing their steak, they placed it under their saddles as they rode to tenderize it. The version that we have come to know was first served in the early 20th Century in France and was called Steak a l’Americaine by Escoffier. The key difference between Escoffier’s preparation and the one we’ve come to know is that the classical preparation was served with tartar sauce rather than egg, probably how we’ve come to know it as “Steak Tartare”. 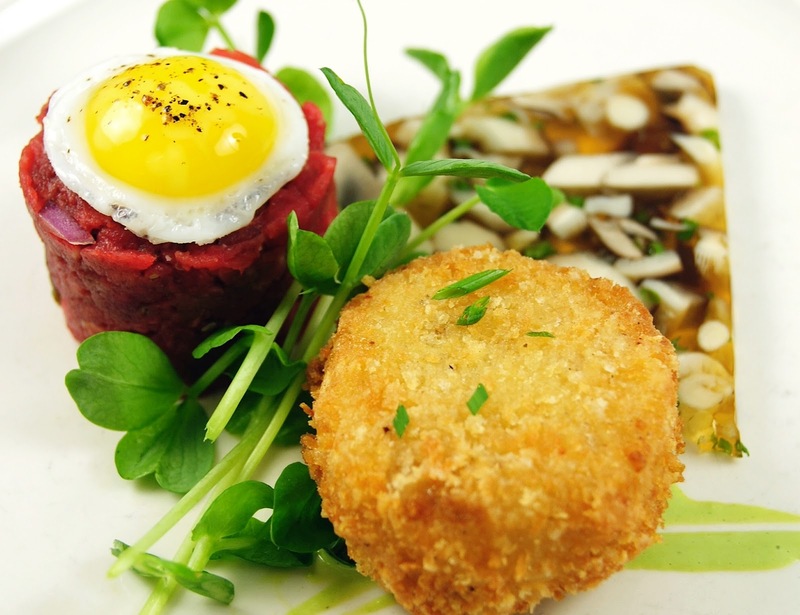 Posted in Appetizer, Beef, Spring, VegetableTagged croquette, quail egg, ramp, steak tartare, terrineBookmark the permalink.